I first came across the Kruve coffee sifter back when it was still just a fledgling Kickstarter running under the name Rafino. It immediately grabbed my attention. I could finally isolate variables down to the micron and get super specific with my grind size. Fast forward a year or two, I finally managed to get my hands on the sifter to put it to the test. Does a super specific grind range really increase the quality of the coffee? I set out with my friend Jeremiah Harlow to figure that out. 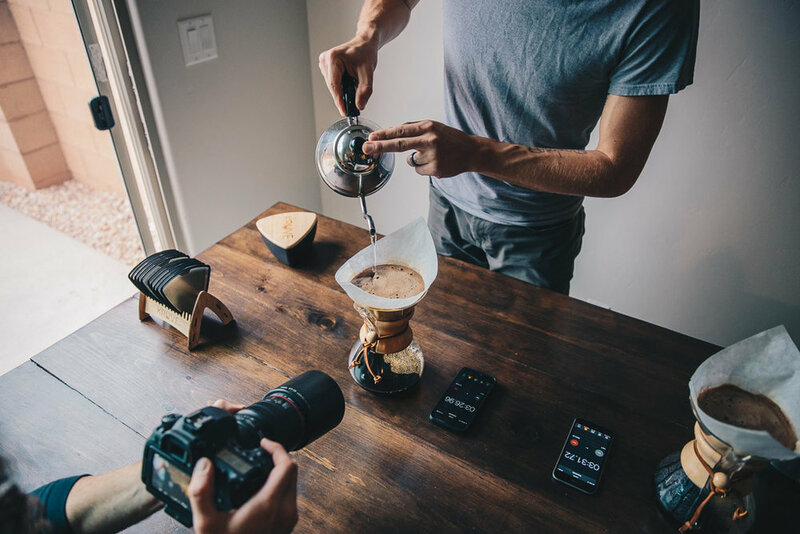 We wanted to accomplish two things with this taste test: 1) determine if the average coffee drinker could tell a difference between sifted and unsifted coffee and 2) determine the value of that difference. For accurate results, we needed to create a blind test environment. So we didn't tell the testers what we did differently to the coffee or which was which, we simply gave them two mugs and asked them to compare them. To eliminate as many variables as possible, we brewed the coffees as similarly as possible. We used the same brew method, the Chemex, at a 1:16 ratio and water at 205°F. Using the Kruve requires slight alterations to brewing technique. For the sake of brevity, I'll save the discussion on those differences for another time. Just know, we used slightly different grind sizes and brew technique to get the best results each style had to offer. We then poured the sifted coffee into black mugs and the unsifted coffee into white mugs. We then gave each taster one of each and asked them to compare the two. To help them focus on potential differences, I asked them questions about the coffees. In the spirit of conciseness, Jeremiah edited out most of my questions, conversational lulls, and repeat information. He worked very hard to maintain the integrity of the information to keep the results accurate. Check out the video below to see what our friends thought! *Important note, in the video I asked if they would be willing to spend between $80-$120 when the most affordable Kruve option is actually $50, which may have had a more favorable response. My bad. For the second test, we wanted to approach it from more of a coffee professional perspective. So Jeremiah and I sat down and filmed ourselves tasting the coffees side-by-side like our friends did. Even though we both knew what we were testing, we still wanted to keep the test as blind as possible. So, we divided the preparation into two parts. I started by brewing the coffee using the same Chemex recipes as before, while Jeremiah wasn't watching. The Chemexes were marked so I knew which one had the sifted coffee in it. Jeremiah then took the Chemexes and poured them into the mugs while I wasn't watching. This created a degree of separation from both of us and the crucial test information. When we finished our comparison, I told Jeremiah which Chemex had the sifted coffee and he told me which mugs had that Chemex's coffee. Check out our full conversation in the video below! We both thought the sifted coffee had a smoother mouthfeel, a slightly heavier body, and a mellower more consistent overall flavor profile. The unsifted coffee, on the other hand, had a more vibrant complexity and inconsistent flavor profile prone to shifts. We determined that the Kruve does not create empirically better coffee, just different coffee. Personally, I think the Kruve removes some of my favorite qualities in coffee, namely the volatility, vibrant complexity, and imperfect flavor shifts. I enjoy that kind of experience in my coffee. However, the Kruve did excel in focusing in on a single consistent aspect of the coffee. Should you buy the Kruve? If you tend to prefer mellower coffees and want that super consistent flavor, you will probably really enjoy the results of the Kruve. For the coffee enthusiast and professionals out there, the Kruve is a fantastic way to really dial in and highlight specific aspects of the coffee you're brewing. It also provides a good benchmark for testing the consistency of grinders. If you prefer more acidity and complexity in your coffee, this sifter probably isn't for you. I wanted to give a special thanks to Jeremiah Harlow for all of his work on the video. He's a super talented photographer and videographer, go give him a follow on Instagram and subscribe to his Youtube Channel! I also wanted to thank Kruve for sending me the sifter to play around with, be sure you check them out for yourself! *I don't receive any affiliate commission for the link to Kruve's website, they did however give me the sifter.